A Note from Alan: A Great Example of Moral IQ in Today's World. Serving the Poor and Needy. “When you hear this message, I will no longer be there,” the voice, characteristically spirited, confident, just a little bit cheeky and familiar to all of France, said on a tape released this week. The words were those of Sister Emmanuelle, a nun revered for her work with the disenfranchised, especially among the garbage-scavengers of Cairo, and renowned for her television appearances in France as an advocate for the poor. She died Monday at a retirement home operated by her order, the Congregation of Notre-Dame de Sion, in Callian, in the south of France. 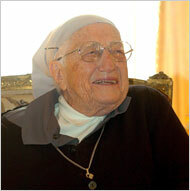 She was immediately praised by the Vatican, her work and achievement likened to those of Mother Teresa. A spokeswoman for her charitable organization, the Sister Emmanuelle Association, confirmed the death. She was 99 and would have turned 100 next month. But Sister Emmanuelle, who told an interviewer in August that she was not afraid of death, was not quite through with her earthly work. The tape, part farewell and part public relations coup, was released by the book publisher Flammarion as part of the announcement that her autobiography, written two years ago and held for posthumous release, would be published Friday. She also wrote frankly of her lifelong feelings of lust, of masturbating as a girl, of falling in love and having to renounce physical love for the love of God. Such energetic candor always characterized Sister Emmanuelle, who was known to favor allowing priests to marry, who was benignly indifferent to homosexuality and who wrote to Pope John Paul II in defense of the use of contraceptive pills, telling him about the slum-dwelling Egyptian girls who were marrying as young as 12 and having babies every year. It was a characteristic that endeared her to the French; last year, Le Journal du Dimanche named her the nation’s fourth most popular person behind the former tennis player Yannick Noah, the soccer star Zinedine Zidane and the actress Mimie Mathy. She was born Madeleine Cinquin on Nov. 16, 1908, in Brussels into a family that ran a lingerie business; her father drowned when she was 6. She earned a degree in philosophy at the Sorbonne and expressed a desire to be a nun from an early age, but she was not all work and no play. The stories of her youth create a portrait of a highly sociable and flirtatious young woman. After she took her vows — in either 1929 or 1931, according to varying reports — she taught in schools in Turkey, Tunisia and Egypt. In 1971, when she was 62, she received permission from her order for what had long been her desire, to move to Cairo and live among the poorest of its citizens in Ezbet El Nakhl, a slum whose residents, known as zabbaleen, share space with refuse, sorting and recycling it for the city, and scavenging in it, too. There she lived in a one-room hut for 22 years, while helping to establish schools, clinics and play areas. The Sister Emmanuelle Association, which she founded in 1980, eventually extended its work to Brazil, Burkina Faso, Haiti, the Philippines, Senegal and Sudan. She returned to France in 1993 and became an outspoken advocate for the rights of the poor. On Wednesday, President Nicolas Sarkozy of France, who called her “a woman of faith with high convictions, but also a woman for whom charity existed through concrete actions,” and Suzanne Mubarak, wife of President Hosni Mubarak of Egypt, along with thousands of other mourners, attended a memorial service for her at the Cathedral of Notre-Dame in Paris. Then he asked for a word she hated, and she replied in English.